It finally happened. After 11 years of almost daily use, our old Vita-Mix container began showing signs of wear (that time I accidentally left a stainless steel spoon in the blender and turned it on probably didn't help...but the spoon lost). So we got a spiffy new one! The 5200 model we got has some nice new features -- new lid, new handle, BPA-free container, and it's quieter than our old one, too. 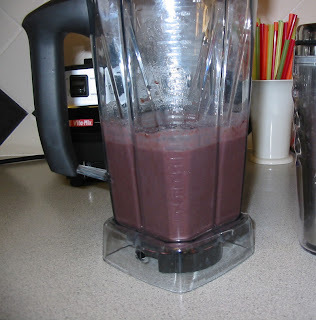 5:30am: Our busy blender's day begins at the crack of dawn with a smoothie for Hubby shmoo (his smoothies involve raw eggs, so I'm not even going into it). 7:00am: I'm finally awake and it's time for my morning smoothie. My breakfast smoothie is almost always the same: 1/2 cup pomegranate juice, 1/2 cup hemp milk, 1 tbs. flaxseed (whole, no need to grind them first), a banana, 2/3 cup frozen blueberries, 1/3 cup frozen pineapple, and about 2/3 cup chopped organic frozen spinach. 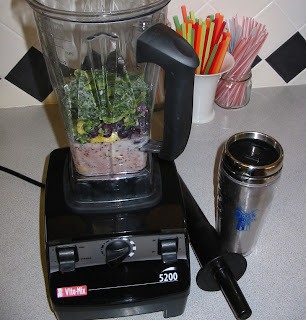 A quick blend and the flaxseed and spinach disappear without a trace. I pour the smoothie into my travel cup, take a couple sips, and head for the gym. When I'm done working out the smoothie is waiting for me in the car, still cold. 10:00am: I whir up a batch of creamy Nacho Cheese for our afternoon out with friends. 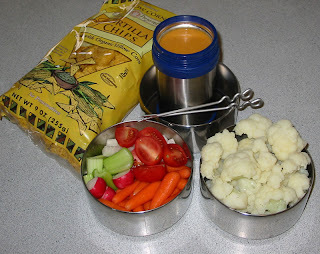 My mom reports that her regular blender never gets these vegan cheese sauces as creamy and smooth as mine. 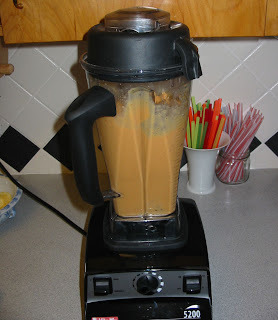 5:00pm: It's time for dinner and one of my favorite Vita-Mix tricks: blending a portion of a vegetable soup and then stirring it back into the soup to make the soup "creamy" without using any cream. 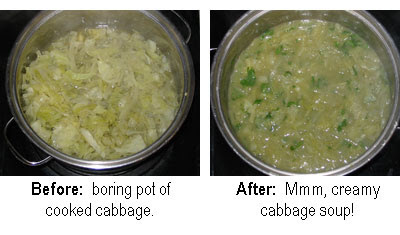 This Indian Cabbage Soup is nice and spicy. I serve it with dahl and brown rice. 7:00pm: Dessert, our favorite! And here's something a regular blender really can't do: make sorbet. Tonight I go all-out and make Healthy Fruit Parfaits. I start by bringing out the bins of frozen fruit I have in my freezer and washing a bowl of fresh (not frozen) blueberries. 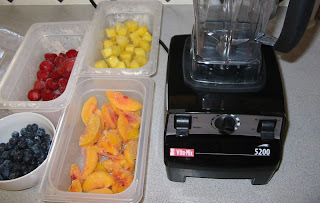 I blend frozen peaches with a bit of orange juice, using just enough liquid to get the blender going while keeping a thick consistency (I use the tamper to keep things moving). I put the peach sorbet in a bowl in the freezer for just a minute while I rinse out the container and blend frozen strawberries with a few pieces of frozen pineapple and just enough soymilk to get it going again. 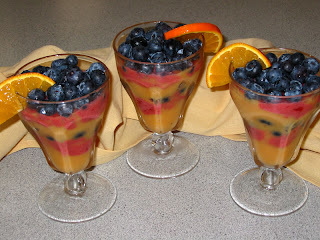 I layer spoonfuls of peach sorbet, strawberry sorbet, and fresh blueberries in pretty parfait glasses garnished with slices of tangerine. Oooh, fancy shmancy! And no sugar! 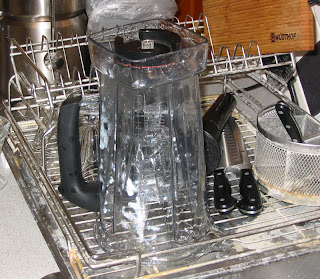 08:00pm: After one last wash and rinse, our Vita-Mix is ready for a well-deserved rest. Good night, Vita-Mix! See you in the morning! 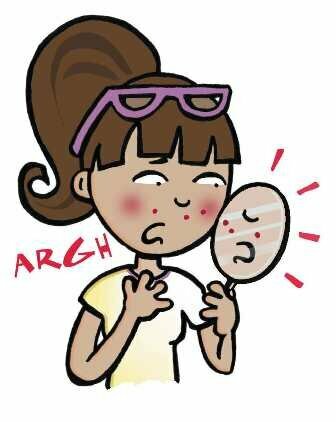 I've dealt with acne my entire adult life (they all told me I'd grow out of it, the liars). And although acne has been linked to milk and dairy products in several studies, going vegan did not clear up my skin at all. Of course, although it didn't contain dairy, my early vegan diet did include daily servings of things like soda, chips, candy, and french fries. When I learned about nutrient-density and started following Eat To Live, things changed. I cleared sugar, white flour, and oil out of my diet and added more fruits and vegetables, and within two to three weeks my acne had disappeared. At first I didn't know what to make of it. Each morning I would stare intently into the bathroom mirror, ready to do battle with my face, and would find that I had nothing to fight. I would stand back and gape at myself. No zits! "When [Loren Cordain, PhD] was told that certain population groups whose way of life is very different from ours had no experience of acne (which is caused by an inflammation of the epidermis, among other mechanisms), he wanted to find out how this could occur...Cordain accompanied a team of dermatologists to examine the skin of 1,200 adolescents cut off from the rest of the world in the Kitavan Islands of New Guinea, and 130 Ache Indians living in isolation in Paraguay. In these two groups they found no trace whatsoever of acne. In their article in Archives of Dermatology, the researchers attributed their amazing discovery to the adolescents' nutrition. The diets of these contemporary sheltered groups resemble those of our distant ancestors: no refined sugar or white flour, thus no peaks of insulin or IGF in the blood. "In Australia, researchers convinced Western adolescents to try a diet restricting sugar and white flour for three months. In a few weeks, their insulin and IGF levels diminished. So did their acne." We’ve been stuck under gray skies so long, I can hardly remember what the sun looks like. It sure feels melancholy around here towards the end of winter. Time to get out of town and take a road trip! Yesterday we packed lunches and rode along with my dad and his sweet dog Libby, up into the pretty foothills of the Blue Mountains. 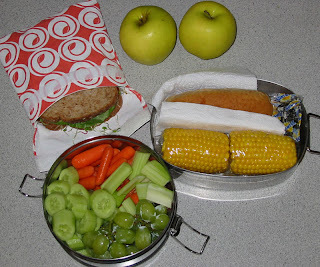 For shmoo’s lunch I packed a veggie dog in a whole wheat bun, two corn-on-the-cobs, and a Sunsweet Ones. What clever marketing is that? They’ve packaged individual pitted prunes in little wrappers to look like candy!! I saw these at the store and just had to give them a try. It seems like they would make the perfect, healthy treat to tuck into the corner of a kid's lunchbox. For myself I made a hummus, sprout, tomato, and lettuce sandwich on sprouted wheat bread packed in our Lunch Skin bag. I also packed a tiffin container of mini cucumber slices, baby carrots, celery, and green grapes, and two Golden Delicious apples. We started out worried about the weather; the car was wrapped in dense fog and the cold was bitter. We guessed we wouldn’t be able to get too far into the hills and would probably have to turn back. But as the car headed up into Dayton we climbed out of the cloud cover and suddenly, there it was! The sun was shining down on us from a blue sky! We had a wonderful, warm tramp about in the hills. The snow was mostly melted away. The ground was mucky but mostly clear. Verdict: Shmoo wolfed down the hot dog and an apple but wouldn’t eat the corn ("too mushy" – it was cooked frozen corn), then said "This is my treat? Nice try!" and handed me the prune. Oh well, I still think it's a great idea. Maybe it will work better with younger children? We nibbled on the veggies and grapes together on the drive back. I discovered that I love popping a slice of mini cucumber and a green grape into my mouth at the same time. Nice flavor combo! Enough of the serious stuff for a moment -- time for some fun! Shmoo and I meet our homeschool friends each week at the community center for games and fun and momma chats. This week I wanted to pack something fun for shmoo and I to share with our friends. I made a batch of Nacho Cheese Dip and packed it in a warm thermos along with a big bag of organic corn chips for shmoo and his friends. I also packed a big batch of veggies for me (the kids were welcome to eat the veggies, too...but they didn't): lightly steamed cauliflower, baby carrots, jicama, celery, cherry tomatoes, and radishes. I packed the veggies in a three-tier tiffin and left the third container empty. At lunchtime I poured the warm dip into the empty container to make it easier for dipping. I also packed some little fondue forks to make dipping the vegetables more fun. Verdict: Everything tastes so good with this dip! I've been experimenting with the recipe and have discovered I can substitute canned white beans for the cashews to make the dish nut-free. I also like to add a bit of fresh salsa to the mix before I blend it, to add more flavor and a nice orange color. (Follow the link to the recipe and you'll see other people's variations, too.) James' best friend was hesitant to try the dip at first, but ended up coming back for more and then more. Can you believe I ate that much cauliflower?? 5 stars. Thank you so much to everyone who took the time to comment on my last post, offering their experiences and encouragement. It’s true, raising a child is so difficult at times, especially now that we’ve hit the preteens! Thanks for all your encouraging words and for sharing your own struggles. It’s so fascinating and affirming to hear from all of you who have also experienced problems with dairy. You know, I’ve often read all the bad news about dairy on sites like milksucks.com and notdairy.com, but I've always taken it with a grain of salt. 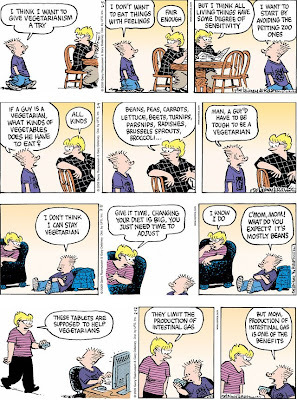 Many people I know (including my husband) consume dairy with no apparent difficulties, and sometimes I think people with an anti-cruelty agenda will say what they have to say to convince people to go veg, even if it’s not exactly true. But now that I’ve witnessed it in our own lives and heard from all of you, I take the dangers of dairy (at least for some) much, much more seriously than I did before. By the way, I wanted to mention that I've also been talking with a fantastic vegan wellness coach who specializes in teaching kids about healthy eating. Gretchen says she sometimes recommends cutting dairy with soymilk, starting at half and half, to start weaning resistant children off milk. Hey, it’s been such a long time since I’ve posted a lunch! I just had to take a picture of mine this afternoon -- isn’t it beautiful? This is pretty much what I eat every afternoon: some kind of salad and steamed veggies or soup. 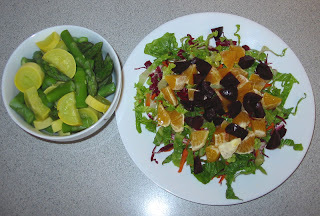 This salad is topped with Blood Orange Vinegar, sliced oranges, and cold cooked beets. I just love all the color and freshness. The cooked vegetables are asparagus and yellow squash. This is such a treat, the first asparagus I’ve had in months – so good! 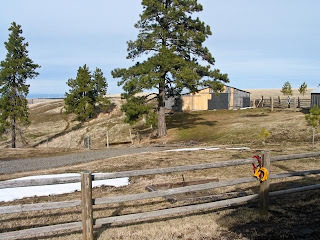 I can’t wait for May, when half my refrigerator will be devoted to our local asparagus. Well, a lot has been happening here, some of it good, some of it bad. In the GOOD NEWS, I’ve finished writing a new cookbook! Vegan Lunch Box Around the World features menus from, well, around the world, with emphasis on nutrient-dense recipes and the healthy vegetables, salads, and fruits I like to feature in my meals (don’t worry – there are more than a few special treats thrown in as well!) Visit my flickr album to get a glimpse at the great pictures my friend Michelle took for the book (the veggie burger is my favorite). It will be available in September, so stay tuned! 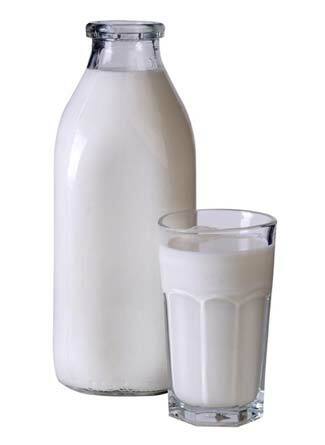 Then a few months ago my husband decided to start buying raw, unpasteurized whole milk. This thick milk comes in glass jars with enormous globs of cream rising to the surface. Shmoo has been sucking this stuff down in huge glassfuls and loving it…it’s like drinking half-and-half. This summer I was alarmed watching his weight go up, and then listening to the doctor prescribe him allergy pills. But I continued to maintain that my son was his own person and could make his own choices. I provided all the educational material I could without sounding too “geez, mom” lectury, but in my mixed household (i.e. without the agreement and support of his father) I feel like I’m only listened to so much, and that my hands are somewhat tied (i.e. I can suggest he lay off the crap, but I can’t remove it from my house). Then in December, shmoo started coughing continuously, day and night, and was finally diagnosed with asthma. Now he carries an inhaler wherever he goes. Since then he’s also suffered two long-lasting colds that never seem to go away. Is it the milk? I hate to talk trash about something certain people near-and-dear to me see as an ideal food, but I honestly think so. Of course, it could also be the junk food we’ve allowed (even vegan food can be unhealthy garbage!! ), or the soda pop he always drinks when he’s away from home, or something else entirely. What’s the moral, peoples? If I had to go back and do it again, you bet I would be laying down the law a heck of a lot more, enforcing instead of suggesting healthier eating, and hopefully would manage to be a better, more consistent role model for my son. I love the last one -- that's exactly the attitude my son has.